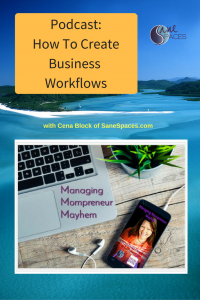 In this episode, learn how to organize, systematize, and document your workflows in your small business. This episode is highly recommended for home-based moms in business who want to streamline their business processes. Learn how to organize, systematize, and document your workflows in your small business. The key to more productivity and time management is planning and systems that allow you to delegate effectively. It all starts with documenting your work and creating organized systems you can rely on so you can do more in the time you have. This episode is highly recommended for home-based moms in business. Do you want guidance and support in this process? You can get your business processes documented and your workflows streamlined once and for all! I can show you step by step what you need to do to get this done, and feel more ease! If you’d like to learn more about Coaching with Cena – Click here to book a complimentary 1-1 Discovery Call and let’s see if I can help!